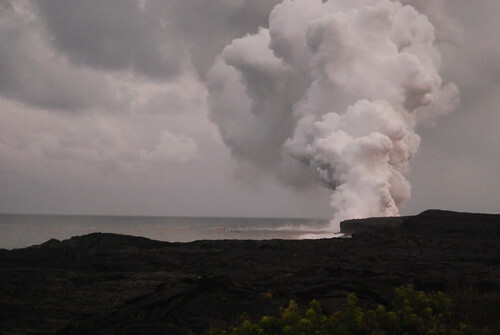 Getting to where the Kilauea lava flow meets the Pacific isn't as easy as you might think. First you need to find an old road that leads out into the lava fields left by an eruption in the 1990s. It's a strange road, with sections of good two lane blacktop connected by winding bouncy single lane track. That's where you're driving over the lava, where the flow rolled over the land and hid the old road. Finally you're at the car park, and backing into a spot. It's still a fair way to the entrance to the viewing area, but that's fine, as you'll need to buy a flashlight from one of the vendors for the return trek. From the entrance to the viewing area is about a mile, but it's a mile over lava flow - rough new rock that crumbles beneath your feet, and undulates unevenly in its pillows, ribbons and sheets. There are plenty of cracks and bubbles, so you need to follow the yellow duct tape markings carefully. All the while you can see where you're going, as a pillar of steam rises high into the sky. The viewing area is about 1/2 a mile from the actual flow, and it's worth getting there early to get a good position in the crowds. We were perhaps a little later than optimum, but still managed to get a decent view. 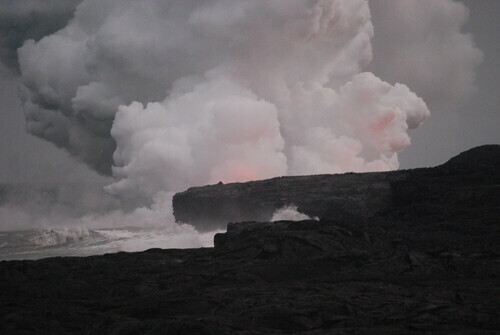 The black lava rolls into the sea, where the land falls away in sharp cliffs. There's hot rock under the boiling sea, and a line of steam shows just how much of the flow is under the water. 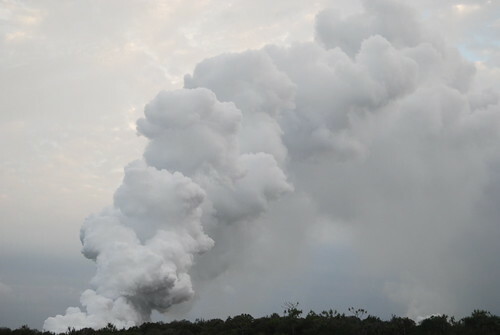 As it gets darker, the white steam cloud begins to take on a reddish tinge, the reflected glow of the molten rock. Occasionally you'll see sparks as water flashes into high pressure steam and a section of black cool rock falls away, exposing the glowing lava below. 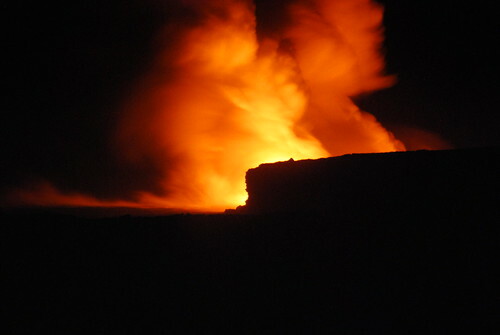 It's when it gets dark that the show begins, red clouds of steam rising from the orange lava, bright against the black sky. I'd taken along my new GorillaPod flexible tripod, and lay down on the lava to get the best angle. Manual focus got me the view I wanted, and a ten second timer made sure that there was as little vibration as possible. The resulting long exposures captured much of the feel of the evening - bright gouts of steam and the occasional burst of hot lava from a steam explosion. You can see the trajectory of an explosion in the first of the images - I wouldn't have liked to have been anywhere near the flow when that happened! 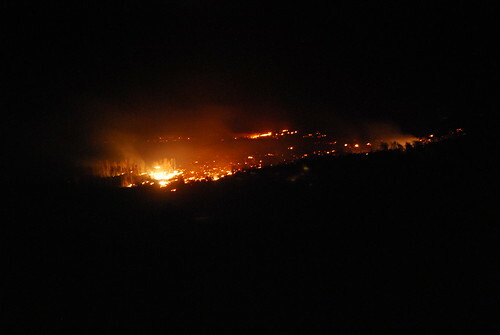 While we watched the main event on the coast, higher on the hills the thin rock over the lava flow was starting to crack, and golden rock was flowing out across the hillside - setting fire to trees and vegetation. I wrapped the GorillaPod around a warning sign, and fired up another long exposure. Amazing! I felt slightly nervous taking pics of hot springs and geysers in New Zealand, but we didn't have actual lava. did you get to see the the Huka falls for the ten minutes they turn it on? did you bathe in any of the amoeba-laden springs? they're wonderful! in true kiwi style, instead of closing the place and taking 20 years to build a new one (Bath council I', looking at you) they put up a warning sign and say 'be sensible adults'. I love NZ. I saw one of my favourite ever warning signs at a thermal park in NZ: 'Persons throwing items into the boiling mud pools may be asked to retrieve them'. Amazing pictures. I'm enjoying reading about your Hawaiian adventures (so sorry to hear that O's Bistro closed!). there's the champagne pool, which we didn't go to as it sounded like the kind of small local resource where visitors without an invite would be intruding, and ahaluni(sp? I posted it) which we did visit. they're both in Puna for anyone tracking them down. I read your description about Ahaluni. It sounds like it may be the hot spring. But I'd have to ask my cousin to validate that, as the pool was definitely a guarded local resource, as you described the champagne pool. (I don't recall any signs about eels.) I wish you were still there and could charm one of the locals into taking you there if the champagne pool is the place where Trudy brought me. That experience was actually what I refer to as The One Magical Moment From That Which Is Ordinary. The full moon was over the ocean, as if somebody had decided to hang it there for decoration, and since it was night, we didn't bother with clothes. I am going to the Big Island and was looking forward to go into a boat tour. But it is very expensive and many things have came up financially speaking that do not allow me to afford it. Still, I already bought the air ticket and I want to make the best out of it. 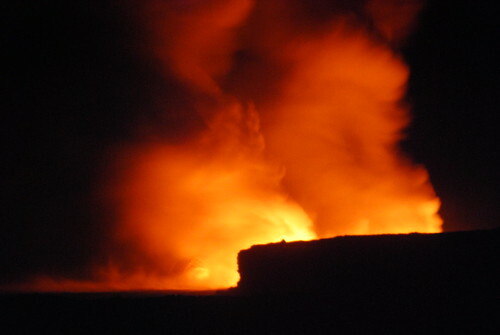 Your best bet is the Hawaii Volcanoes National Park web site. It'll show you what's open where, and how to get to it. The current viewing area is at the end of the old Highway 130, and is about a mile or so trek from the parking area. It's open from 5 until 10 in the evening, with the last car allowed in at 8.